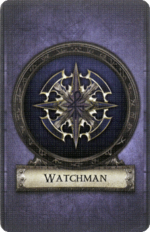 Watchman is a class option for the Healer archetype, available to all Healer Heroes. It is one of the first Hybrid classes, first introduced in The Chains that Rust. It hybridizes with any class belonging to the Scout archetype. As a hybrid class, it gets a limited number of skills itself, and cannot gain the high-end skills of the class it hybridizes with. For example, were it to hybridize with the Stalker class, the Watchman would be able to purchase any class card of the Stalker class (as well as any class card of the Watchman class itself) except Ambush or Upper Hand, since either of those would cost 3 experience points. The Watchmans starting equipment is determined by the Scout class it hybridizes with. Like other hybrid classes, it only receives four skills on it's own, the rest of it's skills dependent on the class it hybridizes with. Vigilance 0 When you gain this card, choose 1 standard Class deck belonging to the Scout archetype. Quick Recovery 1 Use this card when a hero in your line of sight starts his turn. That hero gains 1 movement point and recovers 1 . Trailblazer 2 During the Travel step, apply +2 to your , , , and (to a maximum of 6 each). Unity 3 Use this card when a hero in your line of sight recovers 1 or more . That hero also recovery 1 . Then test . If you fail, exhaust this card. This page was last modified on 24 February 2017, at 00:04.